Jackie (Julie Bez) is in need of some help, she needs a place to stay. A sanctuary where she can reflect on the past and quiet her demons. The guilt of losing her child and an ongoing struggle with addiction are consuming her every thought. In this regard, Havenhurst appears to be a godsend. An insanely beautiful gothic apartment complex where the rent is what you can afford and the house rules are simple enough: live a virtuous life and you can stay as long as you wish. Break the rules…. A terrifying opening sequence featuring a cameo from Daniel Harris (Halloween 4, The Last Boy Scout, Hatchet) goes a long way to establish the brutal tone of the film. Interestingly, Farrands was also the screenwriter for Halloween 6. A film that was supposed to feature a cameo from Harris. I’m not sure if her appearance in HAVENHURST was in any way a response to her not reprising her role as Jaime Lloyd in Halloween 6, but given all the drama that surrounded the production of that film, I wouldn’t be surprised. 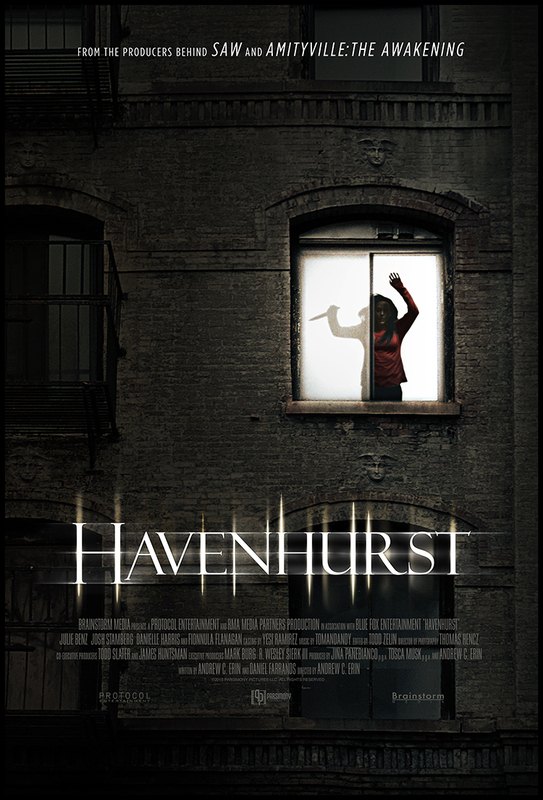 HAVENHURST is one of the rare genre films that could work without the horror. While the horrific elements are immediately apparent, Erin seems more concerned with the character work than the effects and gags. He takes his time in introducing Jackie and allows the character to breathe. Benz is given the opportunity to fully realize Jackie before we see her put through hell. An effective technique that’s rarely used in modern horror, outside of arthouse fare like THE WITCH or THE BABDOOK. An ongoing theme of the film is judgment. We as an audience are confident in our acumen. We see characters who are participating in some truly heinous acts and feel justified in wanting to see them get what they deserve…. and then we see it… The realization of our bloodlust is brutal and unnerving because we demanded it. Because we are culpable. Jackie is by no means a saint and in fact, has done some pretty terrible things. The question we are left with is whether or not the film will cast its judgment on her. Benz who is best known for roles in DEXTER and HAWAII FIVE-O gives an outstanding performance as Jackie. The character is complex and layered. If executed by a lesser actress the film could have been utterly unwatchable. Instead, we see are drwan in by a woman who struggles with her past and is trying to put the pieces back together again. The mark of a good horror film (for me) is one that gives me a few jumps and causes me to squirm in my chair. The mark of a great horror film is one where I would be happy to watch the characters in any setting, horror or otherwise. If there was a family drama about the Torrance family and they never made it to The Overlook, as long as it had been made by the same creative team, I’d be completely onboard. A film that focused on that day Jack Torrance broke Danny’s arm? Yeah, I’d watch that. Side note, don’t make that movie, it’s a terrible idea.